LG has a spanking new multimedia phone in the North American market, and this time it is known as the Trax. The Trax will only be available via AT&T, so subscribers of other networks will just have to sit this one out. What are some of the functions on the Trax that would make you rush out and sign up for one immediately? Read on and decide for yourself. 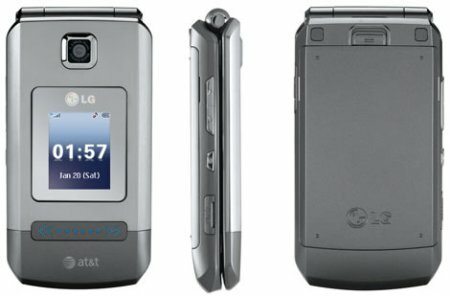 For starters, the LG Trax comes in a sleek clamshell design that hooks up to AT&T’s 3G UMTS/HSDPA network and is compatible with video sharing, video streams, music downloading, and other services currently available on the high-speed network. The LG Trax measures roughly 4″ x 2″ and has a thickness of slightly over 0.5″, which isn’t too shabby but then again it is not the slimmest kid on the block as well. You won’t suffer from a huge bulge in your pants pocket though with the Trax inside, and other features include a microSD memory card slot that helps expand your storage space to 4GB, Bluetooth connectivity for hands-free conversations, a 1.3 megapixel camera, and in-camera photo-editing for on-the-fly modifications to attain that utopian picture perfect moment. As you can see, the hardware contained inside the Trax isn’t anything worth shouting about. What we’re more concerned with is the ability to tap into AT&T’s growing number of entertainment services. As of last month, AT&T launched in 160 markets across the US services like mobile Video Share that lets two subscribers share video during voice conversations (sounds strangely like a standard 3G video call to me), a mobile music service that provides customers a gateway to subscription services such as Napster and eMusic, Cellular Video service that features content from CNN, The Weather Channel, iFilm, Comedy Central, as well as exclusive premium content from cable network HBO. The Trax is available from today onwards at selected AT&T stores as well as online, retailing for $130 after a mail-in rebate as well as having your soul tied down to a 2-year contract.